On February 12, 1991 Leonard entered a Quik Stop market and shot two employees and a customer from close range. The shootings appeared to be a robbery, although nothing was taken except a tin of beef jerky and a few other items. A week later, three workers in a pizza parlor were killed in a similar manner. Authorities believed that the slayings were done for kicks. The unknown killer was quickly dubbed the “thrill killer” by the media. A massive manhunt ensued, and may have deterred the killer from making further attacks. But many months passed before police found Eric Royce Leonard. Leonard was sentenced to death for the murders. One page typed letter. 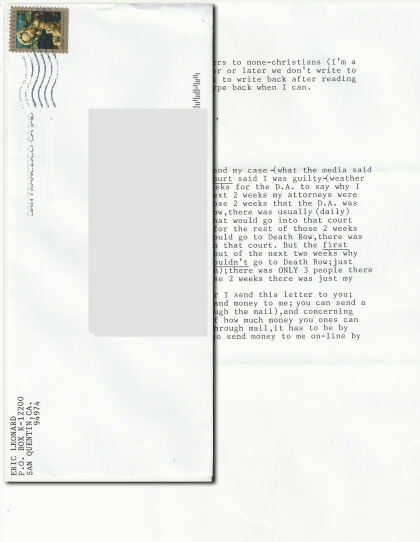 Letter is general content and talks about his sentencing hearing. Letter is not signed. Original typed envelope is included.